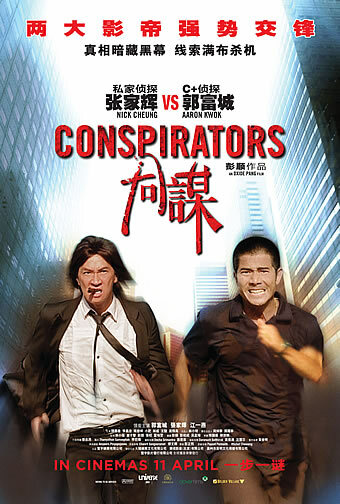 Synopsis: CONSPIRATORS directed by Oxide Pang, stars award winning actors Aaron Kwok and Nick Cheung. It is an action, drama, thriller which talks about 2 detectives from 2 different countries investigating the same case. As their investigation brings them closer to the truth, they found out something else. What can it be, and what is the truth that lies within? 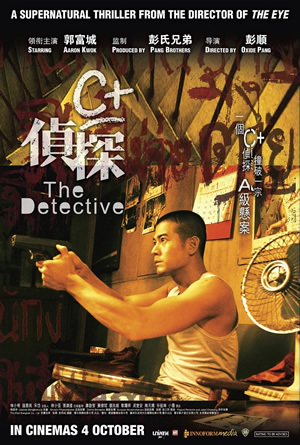 Opting for a less nondescript title than its predecessors – ‘The Detective’ (C+侦探) and ‘The Detective 2’ (B+侦探), ‘Conspirators’ sees Aaron Kwok’s Chan Tam return to solve the mystery behind his parents’ deaths thirty years ago. 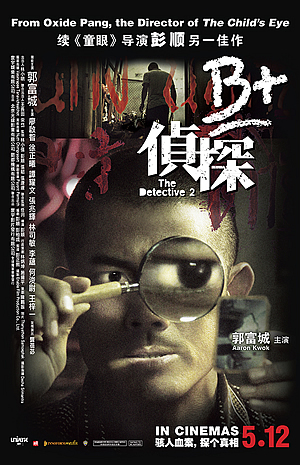 At first a bumbling and inexperienced private detective whose most outstanding feature was his colourful shirts, Chan Tam had in the second instalment transform quite incredulously into somewhat of a psychic, able to piece together a crime just by walking around the scene or looking at pictures of it. Thankfully, he possesses none of that clairvoyance this time round, settling for a more down-to-earth persona that is admittedly less lively than he was when we were first introduced to him but also more convincing than the last. Returning to co-script and direct what has arguably been his most successful venture outside of ‘The Eye’, Oxide Pang finally places Chan Tam’s own tragic past – which had been brewing over the past two movies – front and centre here, with the opening scene directly following from the last where he is told to journey to Malaysia to look for someone named Chai (Chan Koon Tai). The latter had apparently been business associates with both his parents a long time ago, and besides getting to the bottom of just who had masterminded their deaths in cold blood, Chan Tam is also interested to clear their names after hearing that they were both involved in drug trafficking. A twisty but consistently intriguing plot unfolds, with Pang and his regular collaborators – Pak Sing Pang and Wu Meng Zhang – pulling off easily one of their most sophisticated screenplays to date, establishing a web of supporting characters that intertwine in unexpected ways. We won’t spoil the experience for those eager to play detective with Chan Tam piecing the parts of the puzzle; suffice to say that these characters are all connected to Chan’s parents’ – whether as former acquaintances, friends or enemies – and some too to a powerful drug cartel still in operation. There is none of that self-importance from its predecessor to be seen here; instead, Pang relies on some genuine surprises along the way to keep his audience engaged from start to finish. 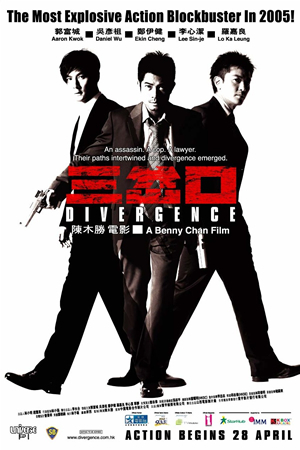 Yet the single stroke of narrative genius that lets this trilogy capper stand tall above both the earlier films is the introduction of the local Malaysian private eye Zheng Fung Hei (Nick Cheung), whom Chan Tam enlists to help track down a number of people connected to both his parents as well as to Chai. While the story calls for Chan Tam to be stoic (it is his deceased parents he is looking for after all), it does allow for Zheng to be an eccentric character in his own right, someone who proves at certain points to be an even more interesting show than Chan Tam is in the movie. That’s particularly so because Zheng is played by the versatile Nick Cheung, whose role here is a perfect combination of both his comical and dramatic skills. Better known for intense roles in Dante Lam’s action dramas ‘The Stool Pigeon’ and ‘The Beast Stalker’, Cheung gets the chance to demonstrate his talent for offbeat comedy with his character’s idiosyncrasies – the most fascinating aspect being Zheng’s Wing Chun skills, which look intentionally anachronistic despite how effective they might be. Clearly relishing the opportunity to be in a less demanding role, Cheung plays his character with wry charm, restoring the quirky sense of humour that made the first movie such an entertaining delight. Cheung also proves to be a more than worthy replacement for Liu Kai-Chi, who in the last two movies had played an informal partner of sorts to Chan Tam. The chemistry between Cheung and Aaron Kwok is palpable in each one of their scenes together, with the former’s drollness and composure nicely complementing the latter’s general sobriety and at times heavy-handed intensity. 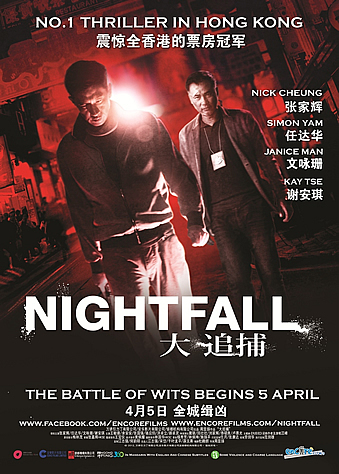 While Kwok gets the chance once again to flex his acting muscles – without the cringe-worthy overacting in ‘Murderer’ thankfully – this first pairing of the two award-winning Best Actors unfortunately sees Cheung stealing the thunder from Kwok from time to time with a decidedly more subtle and nuanced performance. No wonder then that the extended ending provides not just a befitting conclusion to Chan Tam’s trilogy with the signature tune from the first movie – ‘Me Panda’ – but also leaves open the possibility for a spinoff with Cheung’s Zheng Fung Hei and his identical twin brother, the latter of whom we are only briefly introduced to during the course of the movie as a drug addict serving his time in prison after being framed by one of the honchos working for the same person Chan Tam is hunting down. Kudos to Oxide Pang for easily his best film to date, giving both Chan Tam the send-off we think Kwok’s character deserves as well as setting the stage for yet another line of grungy but vivid detective thrillers that he seems to have found his knack for. Both as a thrilling whodunit and as a delightful buddy detective movie, ‘Conspirators’ scores an A-grade.